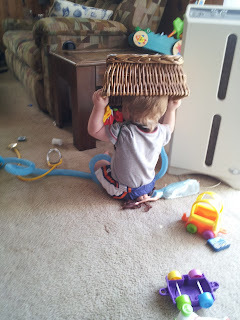 Rambo's Rampages...: I pick things up. I told you I was back. My brain is feeling a little scattered today. Not in a bad way it's just all over the place so this post will probably reflect that slightly. There's a lot of non important things rolling around up there. That's his new thing. 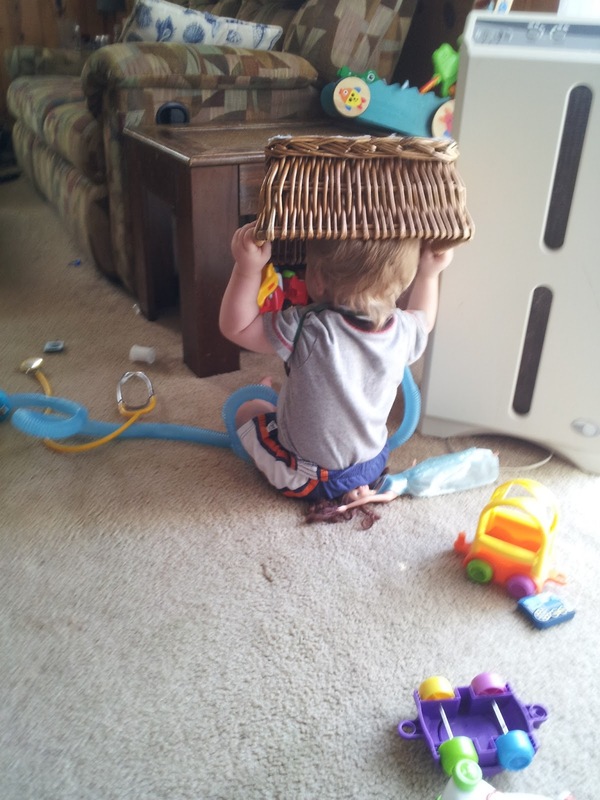 Dump stuff out and put the container on your head. Too funny. You'll see in the second photo that he is wearing shoes and socks and that's because he got the braces for his feet. It's some serious foot wear, especially for these hot summer days, but he really doesn't seem to mind. I'm not too sure why I got to choose from several patterns what the braces looked like because they are totally covered, but whatever. We got him camo anyway. Okay, onto the next subject. Guess what kept me up for like an hour in the middle of the night a few nights ago. The Bay Bridge. Yes this was caused by the car that went over just the other day. Don't roll your eyes yet! I don't mind the bridge. Never have. Never will. I drive over it just fine without fear. It's a road. You drive on it just like you drive anywhere else. So what's the problem??? I now have children. (Children are the cause of many sleepless nights.) I realized that if we were to go over the side of the bridge there is no way I could save them. 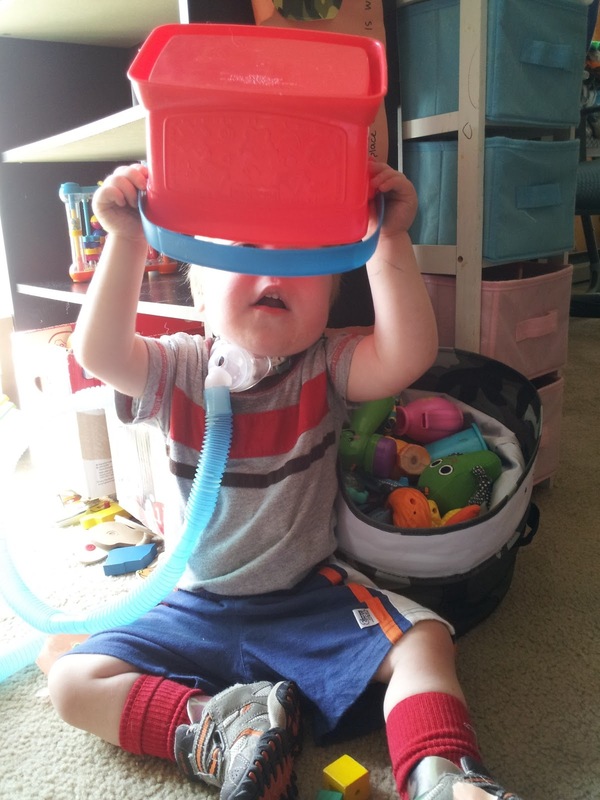 Theodore has a direct tube to his lungs; he'd be a goner right away. No chance. And the others...there's 3 of them... well, I don't need to relive this over and over. And I'm sure that those of you who hadn't thought about this yet will now be thanking me as you're awake at 2am trying to come up with a Bay Bridge survival plan. But since I don't forsee us going off the side of the bridge (and even if I did forsee it) there's not a thing I can do about it. Why worry about tomorrow, right? Speaking of death (nice segue, no?) Ruthie asked me the other day if daddy would give a gun back to a bad guy to save my life. (Ah, a police officers family's life.) My answer - no. No way in the world. Simple as that. Nor do I expect him to. Although, I'm not gonna lie, I kind of do expect him to figure out a different way to keep me alive. I know you will, Ben! And, hon, you have my complete support to act honorably and for the greater good. Actually, I've got nothing. These are the things that run through my mind and make up a day in the life of Amanda. Aren't you glad you're not me?